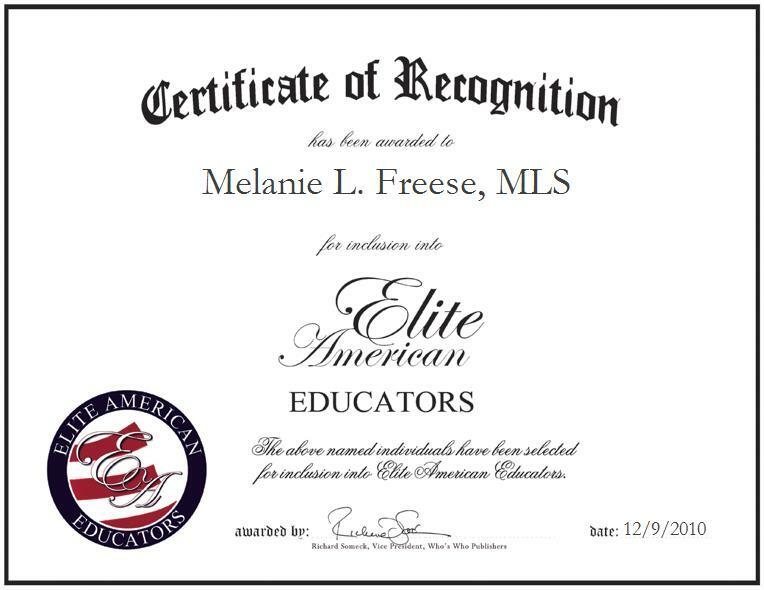 Hempstead, New York, December 9, 2010, Melanie Freese, Associate Professor of Library Services at Hofstra University, has been recognized by Elite American Educators for dedication, achievements, and leadership in education materials classification. As an associate professor of library services, Ms. Freese is responsible for managing and cataloging a variety of materials for the curriculum materials center at Hofstra University. With 38 years of combined professional experience, she has spent the last 30 in her current capacity due to her genuine admiration for her profession and the comprehensive aptitudes she has refined for nearly four decades. In addition to her daily functions, Ms. Freese frequently delivers presentations at Hofstra University’s Axinn Library and consults on specialized services. An award-wining educator, Ms. Freese established her career upon earning both a bachelor’s and master’s degree in elementary education from Hofstra University. After working for several years as an elementary school teacher in Roosevelt and Massapequa, New York, her career path took a pleasantly unexpected shift. Ms. Freese took a full-time position at the Swirbul Library of Adelphi University, where her curiosity was sparked by her desire to become a librarian. As a reserve and circulation assistant, her newfound passion prompted her to pursue a Master of Library Science from Long Island University. Upon its completion, she accepted a full-time position as a cataloger at Hofstra University assuming full responsibility for cataloging all educational and juvenile materials. Over the years she has refined her expertise and accrued honors including an international order of merit, a woman of the year award, a twentieth century award for achievement and a distinguished service award. Ms. Freese’s educational expertise with handling library materials led her to take on a massive project cataloging the rare Nila Banton Smith Historical Reading Collection. The collection contained more than 13,000 volumes consisting of readers from the 18th, 19th and early 20th century as well as children’s books from the same period. An incredible feat to complete, Ms. Freese did so while exuding the dedicated work ethic her parents instilled in her from a young age. For nearly 50 years, Ms. Freese has also taught the Sunday School program at St. Peter’s Lutheran Church. Her multigenerational interactions with children have separated her from her colleagues due to her refined ability to recognize new trends in the needs of her pupils. In 1977, Ms. Freese realized the church’s lack of educational reading materials. She established both an adult and children’s library in 1978. The establishment of these libraries has made an integral impact on the congregation and the Sunday School program. In 1993 she became chairperson of the Institutional Services Committee of the Nassau County Library Association and undertook the mission of creating a library for the troubled girls residing in the Wayside Home and School for Girls located in Valley Stream, NY. She initiated a large-scale project which now serves as the highlight of her career. For an entire year, she worked toward setting up an extensive library of materials to supplement the curriculum of the school. She was responsible for every angle of the project, from soup to nuts, and rallied enough donations to make a difference in the life of troubled girls. For Ms. Freese, the completion of the library itself was not nearly as rewarding as witnessing troubled teens learn to love reading.